VoiceOver is the remarkable new feature that gives iPod shuffle a voice. * It tells you what song is playing and who's performing it. It can even tell you the names of your playlists. So little. 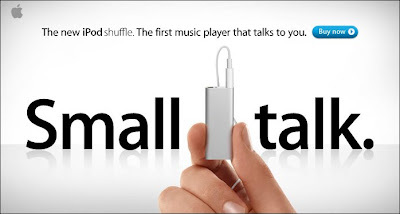 And yet so much.The new iPod shuffle is jaw-droppingly small. Yet there's room for so much more. With 4GB of storage, it now holds up to 1,000 songs and lets you enjoy multiple playlists, too.